We’ve had a beautiful summer driving some exotic on-road machinery, but now its time to get dirty! The monsoon is in full swing, and that means our city streets are flooded, and, more often than not, we’re left driving our regular road cars in some pretty torrid conditions – supposedly on tarmac! For the most part, though, the summer has been good to us. Dhruv has been racing around the globe in the driver’s seat of the Jaguar F-Type and Aston Martin Vanquish. Closer to home, we’ve had a good run at the BIC with some phenomenal machinery, such as the Porsche Cayman S and the Morgan 3 Wheeler, which you can read about separately in this issue. Ashish had his way with a Harley Davidson Fatboy and some stunning Aprilia’s, while Ishan trudged around in a Mercedes GL and the Audi R8 V10, just to name a few. As for me, I’ve been cruising on Royal Enfields, and had a bit of a blast with the new VW Polo GT TSI. All of these sound really wonderful, but at the end of every month all of us sit together and we still don’t have a look of true satisfaction on our tanned faces. Some people like the monsoon and some detest it, but we all know one thing for sure – when it rains, things get messy. There was really no point for us to go on sulking in the humidity of Delhi, so we decided to do the most logical thing – embrace it. Ashish came up with a brilliant idea that would not only lift our spirits, but also get our adrenaline pumping as well. A couple of phone calls were made, and our plan was set. We were going to take some pure bred off-roaders to some of the most muddy, slushy and rocky trails we knew of. There aren’t really too many options for vehicles but the obvious – a Mahindra Thar, a Force Gurkha, and, to add a catalyst of fun to the equation, two maniacal ATVs from Polaris. Now, we’ve spent a fair amount of time with all these machines before, but not quite like this. Our plan was to test the boundaries of these machines to the extreme – and thanks to the monsoon we could do this to our hearts content. The Thar we got from Mahindra this time came with proper off-road tyres. The Gurkha was an older model, because the Force Motors media car was in Chandigarh and couldn’t be brought back in time. But the mechanicals are largely the same, and this too came with proper off-road tyres. Then we had the Polaris Sportsman and the Ranger RZR S, and these already come fully stocked to take you practically anywhere. The day’s shenanigans began with the Thar. We tried to follow the Polaris machines through a fairly deep ditch right in the beginning of the day, and ended up learning a valuable lesson about the Thar –that its approach and departure angles aren’t great. The approach is actually not bad, it’s the rear bumper that hangs a little low and is, therefore, vulnerable when performing extreme off-road maneuvers. Even though we knew that getting the Thar through the ditch on its own power would be pretty difficult we tried our luck anyway – the Gurkha was fitted with a heavy duty winch you see. After carefully angling the Thar in, expectedly, it got stuck – and even the pretty powerful 2,498cc CRDe engine with its 250Nm of torque powering all 4 wheels couldn’t get it to budge. While the Gurkha was circling to come around from another route, we decided to use manpower and not horsepower to get the Thar out. The funny thing was that this was Dhruv’s second time off-roading with the Thar, and also the second time he saw it get stuck – so it got no love from him at all. We then decided to take the Thar through a deep murky pool – I say deep because we only found out the extent of its depth after I attempted a crossing. As I engaged 4W-Low in the Thar, I hit the gas and went for it – shifting to second just before entering. To my surprise, the pool was deeper than anyone thought, and the Thar literally dove into it like an Olympic diver – head first. My first reaction was ‘Oh oh, this is NOT going to end well,’ but I kept the gas pedal pinned all the way down and the Thar brought me out of what turned out to be a pretty serious water crossing without a problem. The Thar is, indeed, a very capable machine, but it just seems a little too brittle in places. Everything in the interior just falls apart, and it’s certainly not the most comfortable machine. The steering is off-center in the cabin, being angled towards the left – Dhruv jokingly says that this trait is inspired from old Porsche 911’s – and your knees and elbows keep getting hit hard when traversing bumpy terrain. Nevertheless, for 7 lakhs on-road, it’s more of a toy for off-road enthusiasts looking to have a little fun. 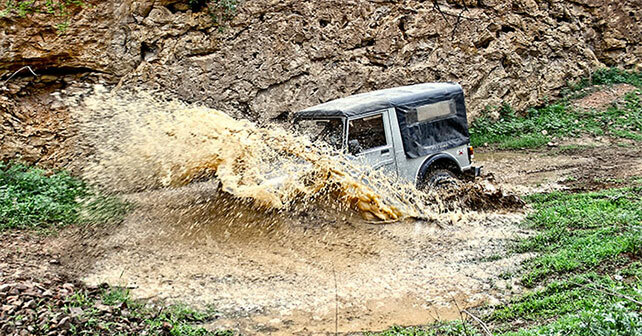 It was now time for the Gurkha to prove its metal. It comes with an old-school 2,596cc direct-injection diesel engine made by Mercedes. It’s extremely heavy, at almost 2,500kgs, so we didn’t want to take a chance with any more pools we didn’t know the depth of – plus it belonged to a friend of ours. The interiors of the Gurkha are much better put together than the Thar, but that’s not really saying a lot as it’s still quite scrappy and there are huge gaps between panels. Plus, you really need to stretch to reach the gear lever. The ergonomics are a little better on the newer model though. The Gurkha comes with independent suspension and a double wishbone arrangement with an anti-roll bar in the front, while the rear uses a more old-fashioned leaf spring, anti-roll bar, and live axle combination. It is very mechanical indeed, and there are two separate levers for the front and rear differential locks. We had the 2009 model year, and I must say that it looked very good. It was fitted with large Cooper Tires and nice alloy wheels. This older design, in my opinion, also looks better than the newer model. But this day was not about style, we wanted to see just what the Gurkha could do. So we started with a steep ledge of about 3 feet that had a 75-degree incline. This seemed like a pretty challenging obstacle for any off-roader, so we decided to see if the Gurkha could climb over it. This was also my first time ever driving the Gurkha, and I was incredibly surprised by the way it performed. All I had to do was shift into first gear, release the clutch, and let the car run up the incline at idle. I didn’t even need to press the accelerator, as the Gurkha just calmly drove up and over the ledge. We tried this on many other steep inclines, rocks, and boulders, and each time the Gurkha gently made its way over every obstacle. This is, indeed, a proper off-roader – but the one thing that holds it back is its massive size. It also has less torque than the Thar with 230Nm, but the gearing ensures that it’s more than adequate to conquer virtually all obstacles. It was now time to get really dirty, and the Polaris vehicles were perfect for this. 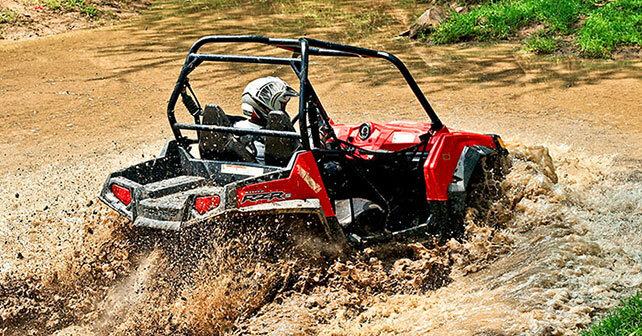 Between the Ranger buggy and Sportsman quad, these are the most fun vehicles you can both drive and ride respectively when the going gets rough. With their light weight and torquey engines, they accelerate so fast that you sometimes need to back off the throttle. 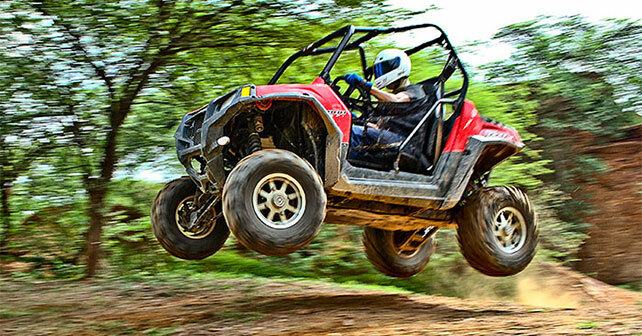 Funny story again – this was Dhruv’s second time driving the RZR, and also the second time he flipped it over. He still loved it though. In all seriousness, though, the RZR has the tendency to flip over quite easily if you attempt to change direction too fast when the ground slips away from you – perhaps the rounded sidewalls of the off-road tyres, which are so suited to rough terrain, have a part to play in this. The Ranger weighs just 453kgs, has all-wheel drive on demand, and can speed from 0 to 60km/h in just 3.8 seconds, and it can take you over virtually any terrain – which is why you do need to be careful in this machine. The advantage of long travel suspension and serious off-road tyres, though, is that you can take liberties with the RZR that you simply can’t take with a normal off-road vehicle. We managed to jump the RZR several feet in the air, and found that the landing was akin to falling on a bed of goose feathers – such is the capability of the suspension on the Polaris. Even when we flipped it on its side, the only thing required was a shove to get it back on four wheels once again, and off you go – no drama. If, however, you want to take on some truly deep pools and climb steep inclines without a problem, then the Sportsman is better suited still. We found an even bigger pool this time, and Ashish accepted the challenge to ride through it and then exit up a 70-degree, 10-foot incline. We watched on as Ashish battled though the water, and raced the Sportsman up the incline. This one challenge alone was proof enough of just how well these Polaris vehicles can perform, and, quite honestly, are the true off-road champions. It was a hot, humid, and mucky day, but we enjoyed it to the fullest. While we all have a need for speed, sometimes challenging obstacles with torque heavy vehicles on off-road trails is what we crave. All the vehicles we had perform in their own right, and can be a lot of fun. 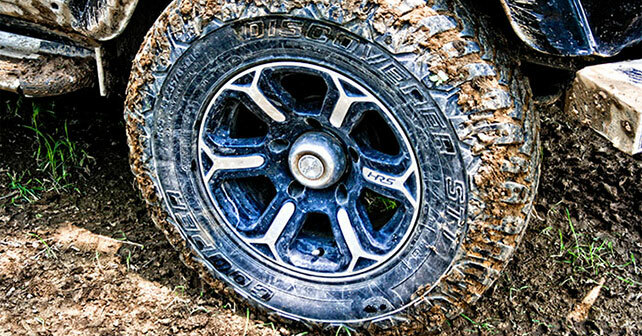 You just need the right vehicle for the right trail – and the right driver!